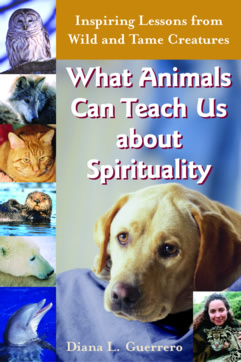 Vision of the Eagle is chapter six of What Animals Can Teach Us about Spirituality: Inspiring Lessons of Wild and Tame Creatures and looks at far-sightedness, inner vision, detachment, discernment, mindfulness, and letting go. Eagles, pelicans, bats, and bears service as instructors. "The eagle careened over my head, diving toward an invisible meal--and taking my breath away in the process. His talons gleamed in the first rays of the sun, and his white head and dark body sharply contrasted against the sky. He missed his target, but quickly adjusted and soared high into the air. As he majestically moved across the ridge, he was highlighted not only in my sight, but also in my mind. In all my years of living in the Big Bear Valley, this was my first glimpse of a wild bald eagle, but it was only the beginning of some unusual and spectacular sightings. Bald eagles are enormous birds. Weighing up to fourteen pounds, with a wingspan of six to seven feet, there birds roost on snags or dead-topped trees. Their sheer size requires tremendous energy and space for takeoff and landing. Treetop perches provide the birds with roosting spots and favorable hunting views. They react to the slightest disturbances and can see the smallest speck in full and clear detail. Eagles are highly attuned to receive information and are sensitive to their surroundings..."